« Does Your Resume Cut the Mustard to Get Interviews? I cannot believe that summer is almost over. I say this every year, but this summer has gone especially fast for me. Since I used to teach elementary school, and then taught at a local University for 10 years, I think of September as a new beginning – a time to think about where I am in my career and what I want to do next. The busiest hiring season is upon us – September thru October. Now is the time to evaluate where you are in your job search, or in your career, and to make adjustments – new beginnings – as needed, so that you are on track to get optimum results. These days, being smarter than your competition matters more than ever, when you’re looking for a new job. So, it is important to know what works and what doesn’t when conducting your search. – if you want something to change, you have to do something different. If you need to make a change, recognize change is easier said than done. As creatures of habit, we will typically gravitate toward our comfort zones, even if that comfort zone is not all that comfortable – or is not what we need! http://www.nasa.gov/multimedia/imagegallery/image_feature_2047.html#.U_3q5mOKU3s On Saturday, June 11, 2011, International Space Station astronaut Ron Garan used a high definition camera to film one of the sixteen sunrises astronauts see each day. 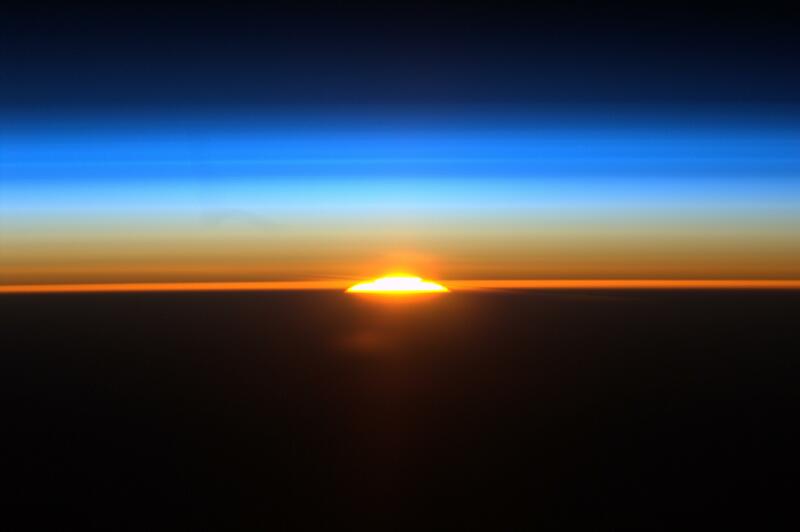 This image shows the rising sun as the station flew along a path between Rio de Janeiro, Brazil and Buenos Aires, Argentina. Intentional action … insanity is doing the same thing over and over and expecting different results…if nothing changes, nothing changes. Change does not happen by itself – it takes deliberate action to make a change and then it takes 21 days of repeated actions to make a change a habit. Space … say goodbye to what is not working in your life in order to make room for what you want; develop reserves and make room in your calendar, checkbook, and mind. Structure … decide what needs to happen to make the change come about, and then list all the steps to get you there…break each step into bite-sized chunks (to avoid overwhelm) and create a safety net to minimize risks. Courage … to face FEARS (False Expectations Appearing Real) and quiet your worried mind. Support … especially from close family members and other “important” people in your life. The right support in your life will yield optimum results. A coach, or a support group, can help with your vision, help you create ‘forward’ action, help you find the space you need, keep you from feeling overwhelmed and help you articulate what support you need to make changes in your life. This entry was posted on August 27, 2014 at 2:31 pm and is filed under Uncategorized. You can follow any responses to this entry through the RSS 2.0 feed. You can leave a response, or trackback from your own site.